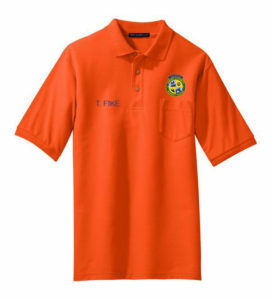 We have designed a new T-Shirt & Polo that will be available for purchase by members this summer. The Shirt is made by River’s End (style 1002) 100% Poly UPF 30+ Short Sleeve Crew Neck T in Safety Orange. Our logo will be silk screen in white on the left chest and right sleeve. The back will have white lettering. The Polo Shirt is 100% poly with a left breast pocket. Our full color logo is embroidered on the left above the pocket. The shirts are also personalized with our members name embroidered on the right breast.